From the beginning, the history of abstract art in the twentieth century has been dominated by the opposition between two major stylistic tendencies, one gestural and lyrical, represented for instance by Kandinsky's Improvisations, the other structured and geometric, as in Mondrian's gridlike compositions. Throughout the century this opposition remained central to the discourse on abstraction, leading sometimes, notably in the decade following World War II, to fierce debates between partisans of each faction. Today, almost a century after the birth of abstraction, is such a distinction still relevant? 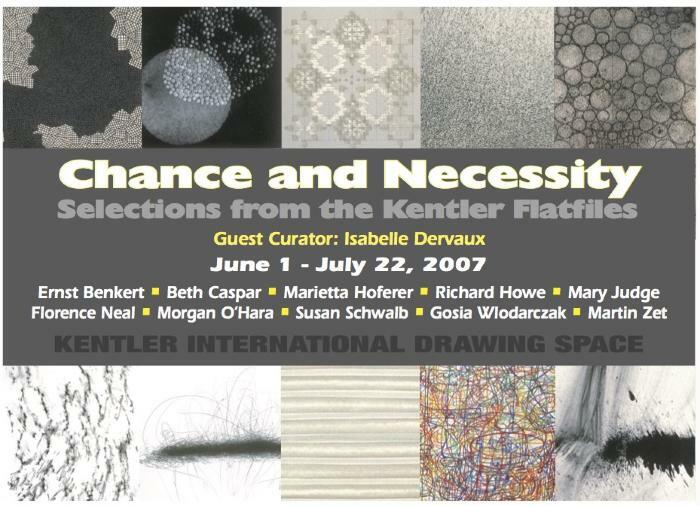 Looking at recent abstract drawings in the Kentler Flatfiles, it is striking to see how many of them seem to fit within these categories--at least at first sight. A closer examination of the methods and processes used by the artists, however, reveals a shift in the notions that each of these types of abstraction implies. The selection made for this exhibition proposes a dialogue between works related to the two tendencies, recasting in contemporary terms the traditional division between an emotional approach and a more intellectual one. 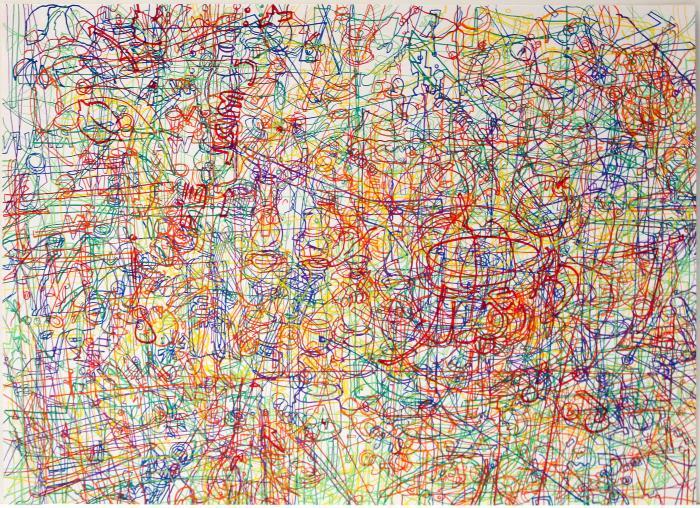 Morgan O'Hara's tangles of lines look at first like an uncontrolled expression of emotion. 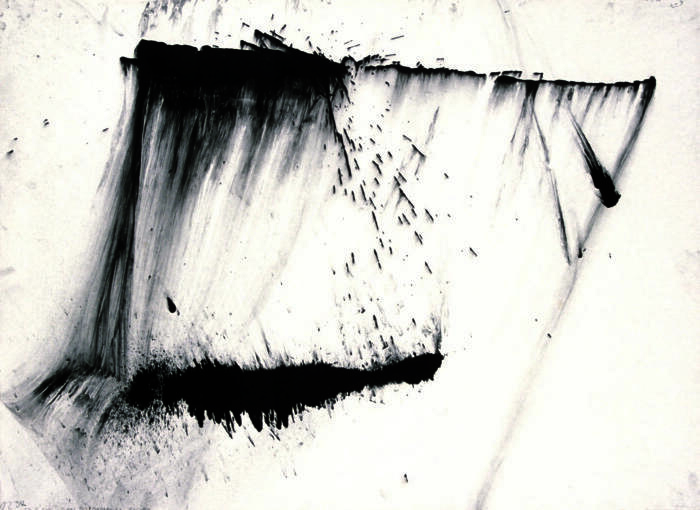 The dense accumulation of graphite in certain areas and the lines that emerge from them in a seemingly erratic fashion, convey a sense of confusion and randomness. Yet, these drawings are visual recordings of movements that are far from erratic and that the artist described with the most unexpected precision on the sheet itself, as in, for instance, Live Transmission: movements of the hands of Martha Argerich, Classical Piano Prokofiev Concerto #3, first movement, Teatro Donizetti, Bergamo, 5-Jun-1992. Following a highly controlled process, O’Hara draws these movements methodically during a time-based performance, often holding pencils in both hands, without concern about the final composition. 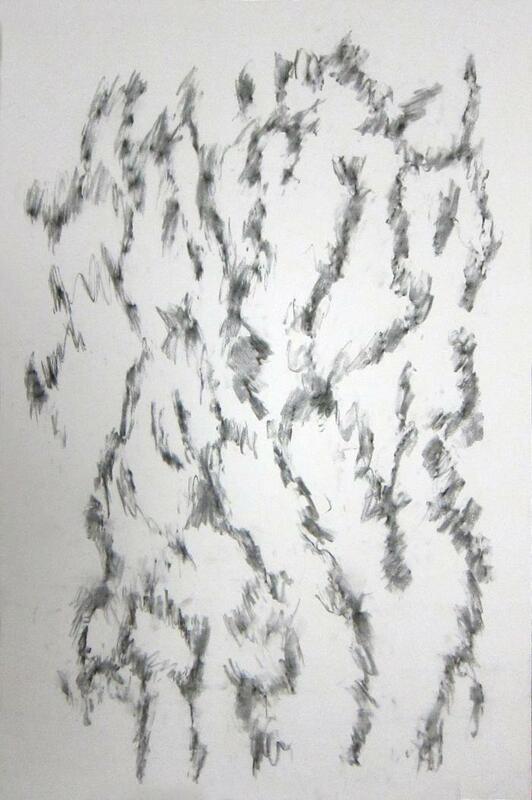 Drawing as a performance is also at the core of Gosia Wlodarczak's work. Holding felt-tip markers as an extension of her arms--often with both hands as well--Wlodarczak invests her whole body in a relentless act of drawing in which she captures in layers of traceries on paper the experience of living, walking, breathing, and other everyday activities. The seemingly random network of lines that results belies the exact methodology involved in such a recording of the artist’s interaction with the world around her. Several drawings in the exhibition are based on nature, not as a source of observation and transformation, but through a process involving direct contact with a natural element. 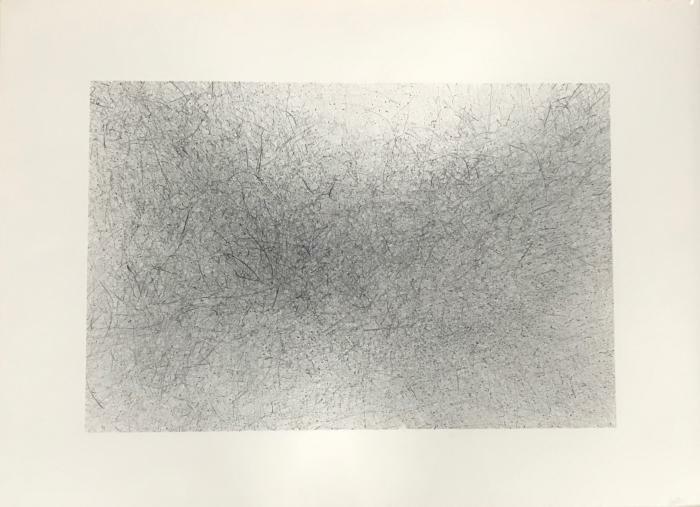 Thus Martin Zet's Sea Drawings are literally produced by the motion of waves washing over the sheets of paper that he places on the sand or stones near a body of water, while Florence Neal's large, evocative charcoal drawings are rubbings of tree bark. Such methods recall surrealist practices, including coulage and frottage, which gave an important role to chance in artistic creation. But unlike the surrealists, for whom such practices were often a starting point to stimulate their imagination and develop new imagery, Zet and Neal preserve the drawings as they first emerge from the random process. With the precision of scientists making an experiment, both artists carefully record the geographical spot where each drawing was created, as well as, in the case of Neal, the species of tree from which the rubbing was made. Rather than a specific style, what unites all of these works are the notions of process and chance. The result may suggest spontaneity and raw impulse, but the carefully planned methodology and the systematic recording of the conditions in which they were executed also relate these works to the kind of abstraction more obviously based on structures and systems. 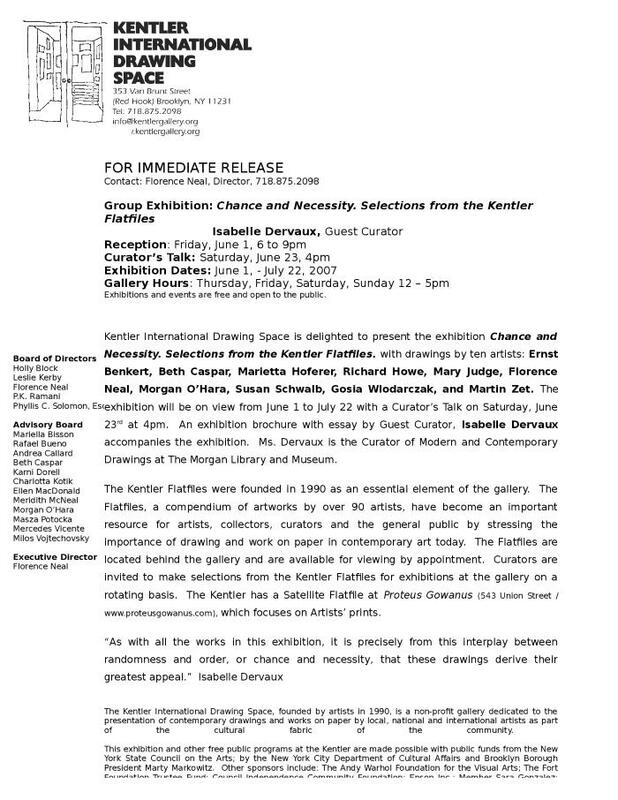 It is significant that several of the artists in this exhibition have mentioned the importance of John Cage in their development. Cage’s revolutionary introduction of the element of chance in art, as well as the priority he gave to process over structure, opened the door to a wide range of new possibilities, in the visual arts as well as in music. 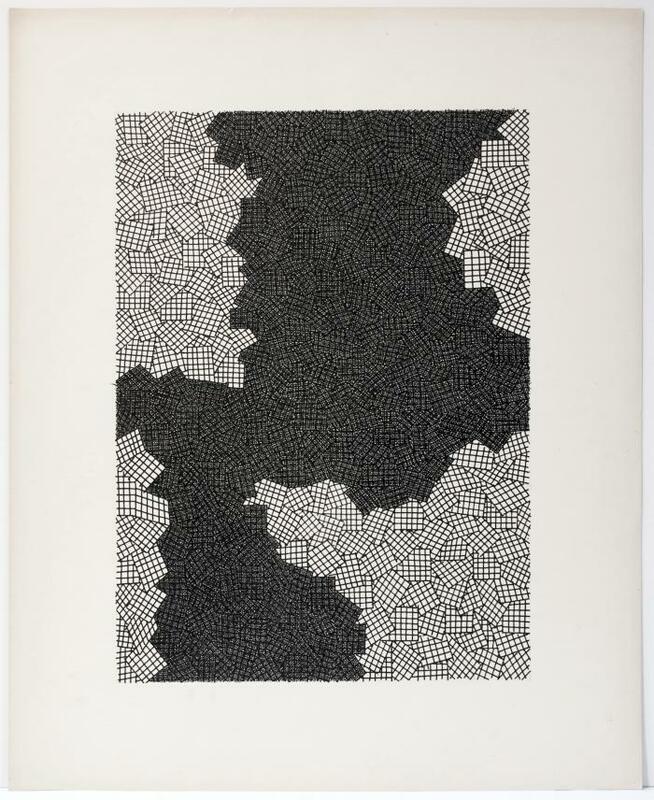 Richard Howe, for example, acknowledged the influence on his drawings of his experience working on Cage’s scores in the 1960s. 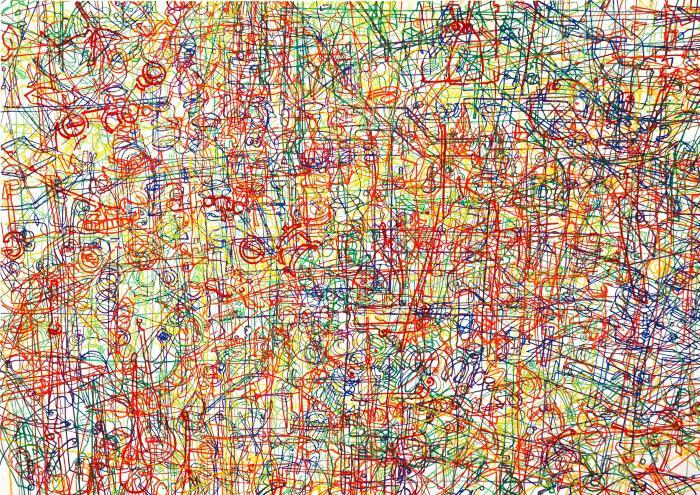 Howe’s teeming compositions call to mind the ambiguous relationship between order and chaos that was central to Cage’s theory and practice. Turning to artists whose drawings rely more directly on the codified language of geometric structures, one notices that their predetermined order is often balanced by some element of indetermination. Thus Mary Judge’s elegant symmetrical patterns derive their organic quality from the medium--powdered pigment--which is applied in such a way that each line, made of irregular dots, acquires a life of its own. Despite the regularity of the motifs, the drawings are vibrant with a sense of unpredictability--a feature that is alluded to in a title like Automatic Drawing, with its reference to another surrealist device involving chance. Marietta Hoferer's collages made out of clear tape are based on a regular, modular composition of symmetrical patterns arranged into a grid format. Yet, minute differences in the size and texture of the tape affects its reflectivity, producing endless variations in the luminosity of the drawing, whose surface changes constantly under the eyes of the viewer like the surface of water. 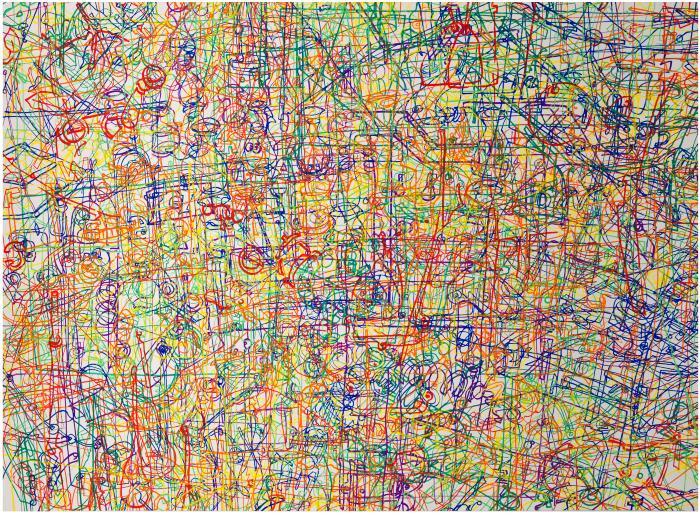 Irregularities in the predominantly geometric drawings of Susan Schwalb and Beth Caspar also elicit comparisons with the natural world. 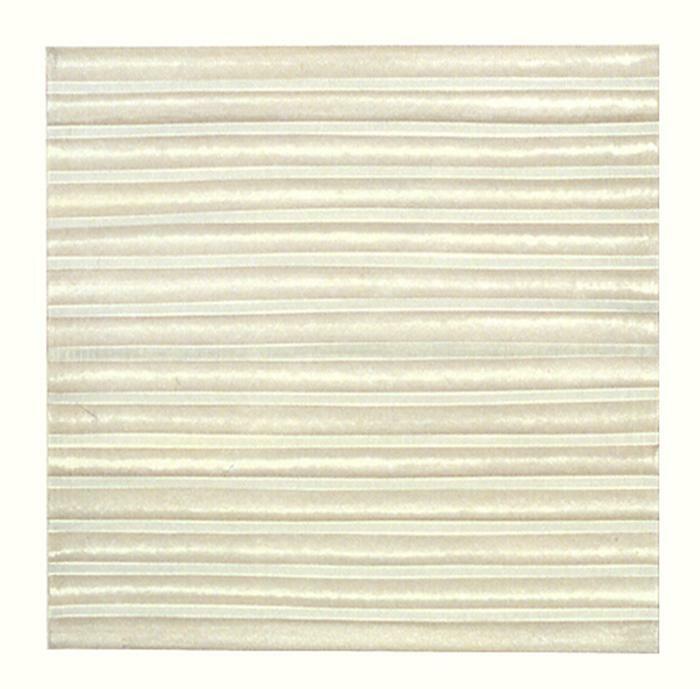 Schwalb's delicately drawn horizontal patterns bring forth the gentle curves of geological formations, a resemblance confirmed by the title of some of the drawings--Strata--and brought home by their chalky color. In Caspar's Circle/Square series, the interpenetration of circular forms and their suggestion of movement conjure up atomic particles or the world of molecular biology. Has pure geometric abstraction lost its appeal? Even among the drawings that appear the most faithful to a stark geometric format, as are Ernst Benkert's compositions, various disturbances compromise the strict order. Intimations of chaos appear in Ventspils, which looks like an accumulation of grids falling down, or in Hairy Mess, in which the unevenness of the border is dramatized by the regularity of the dense network of black lines that makes up the drawing. As with all the works in this exhibition, it is precisely from this interplay between randomness and order, or chance and necessity, that these drawings derive their greatest appeal.